This report is designed specifically for SBA lenders in need of a Certified Business Valuation. Our certified appraisers use their unique business ownership and valuation experience to produce high quality reports in a timely and efficient manner. Our firm strives to provide excellent service through collaboration and open communication with our clients. This report is designed specifically for SBA Lenders that are looking for a Certified Business Valuation for a business that requires 7(a) financing. Important note: the SBA considers an employee/employer [buyout] to be a close relationship. Consists of the Direct Capitalization of Earnings Method, used when earnings are projected to remain at a constant growth rate, or the Discounted Cash Flow Method, used when earnings are projected to fluctuate before stabilizing. The appraiser uses his judgment based on historical financials, among other attributes. Consists of the Direct Data Market Method which derives multiples as a factor of sales and earnings streams from historical transactions of similar businesses. The valuation considers historical and current financial performance and assumes that the subject business will be sold on a debt-free basis. 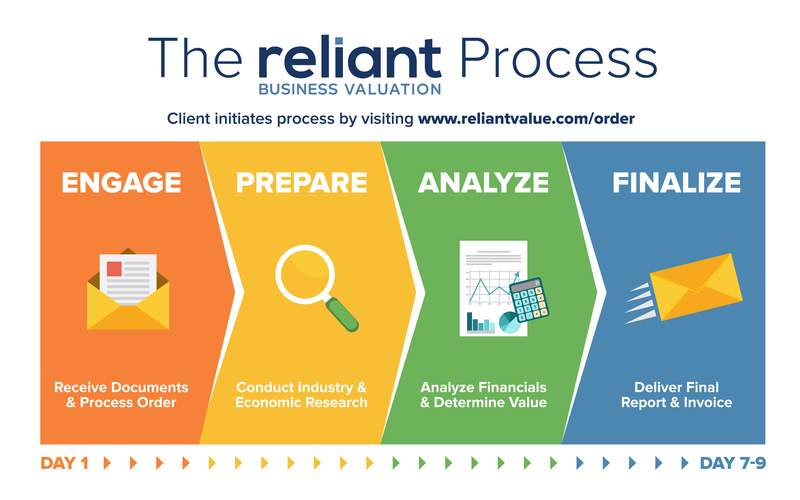 Also commonly known as the “cost approach” or the “replacement-cost approach.” Each asset of the business is valued separately (typically excludes intangibles) and the total of the liabilities is subtracted to derive the total value of the enterprise. Our typical turnaround time is 7-9 business days from engagement. This can vary based on the complexity of the deal, and will be clearly conveyed prior to engagement. Do you offer rush options? Yes, we offer 5 and 7 day rush options for an additional cost. Availability is based on our queue at the time of request. Please contact us for more information. What documents do you require in order to engage a report? Please visit our valuation order form page and click to Step 2 – Document Checklist to view a list of documents required to engage a report. Do you provide sanity tests or rules of thumb? Yes, we are able to conduct sanity tests on a case by case basis. Please contact us for more information. How much do you charge to update a previously completed report or assign a report to a different client? Pricing varies on a case by case basis. Please contact us for more information. The firm was founded by Neal Patel, who currently holds the prestigious Certified Business Appraiser (CBA) designation from the Institute of Business Appraisers (recently absorbed by the NACVA) (only 1 of 6 CBAs in New Jersey, and 1 of 292 globally.) Accreditation as a CBA is available to those members of the IBA who are able to demonstrate that they have attained a high level of professional competence and conduct. Neal also served a 2 year term as the Chair of the Board of Governors at the Institute of Business Appraisers. Neal Patel, Kevin Zaballero and Robert Vafiadou have all earned the Certified Valuation Analyst (CVA) designation from the National Association of Certified Valuators and Analysts (NACVA). Our outstanding quality, superior service, and quick turnaround time are just few of the reasons why over 100 SBA Lenders engage our services. Contact us today how we can assist your SBA lending department. Subscribe to the SBAValue™ newsletter! Get industry leading insight as well as up-to-date information on SBA Business Appraisals from our popular newsletter, SBAValue™.